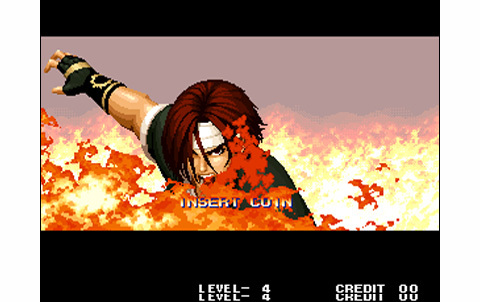 The King of Fighters 95 is a game to mark a milestone for SNK, and this for multiple reasons. 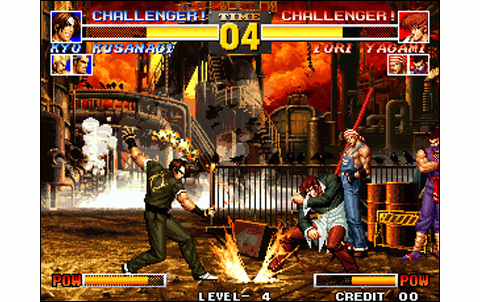 First, it's the best-selling ever title in the history of the Neo Geo (AES, MVS and CD included), but it's also one of the firm's productions that earned the most money on the arcade market. 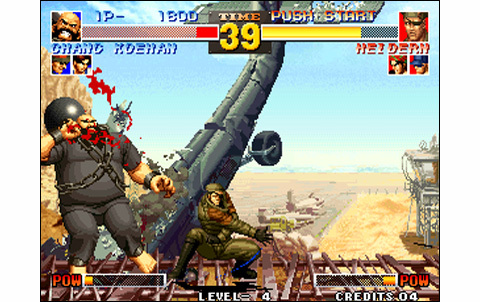 The system combat team was inaugurated by Kof 94, and it was an earthquake in the world of fighting games: a strong hearty roster - the largest of its generation - sorted with a deep technicity for the gameplay. 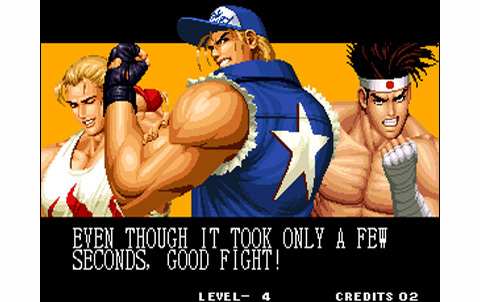 All these qualities have rapidly made it the mascot of VS fighting aficionados. 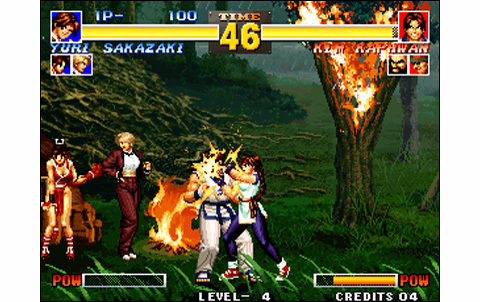 Maintaining a roster of twenty-four characters, this new installment differs some veterans in favor of four new members: Saysiu Kusanagi appeared as the first boss, Billy Kane that we had not seen since Fatal Fury Special is back; Eiji Kusaragi, the Ninja Art of Fighting 2 also returns "from the dead". 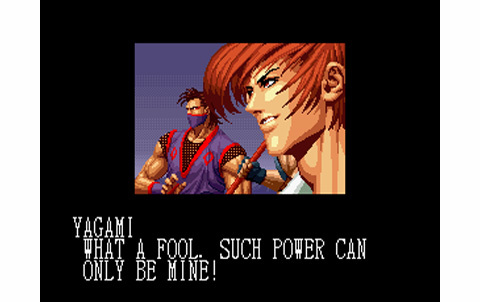 But what makes this episode special is the first appearance of charismatic Iori Yagami in The King of Fighters, as a rival of Kyo Kusanagi. 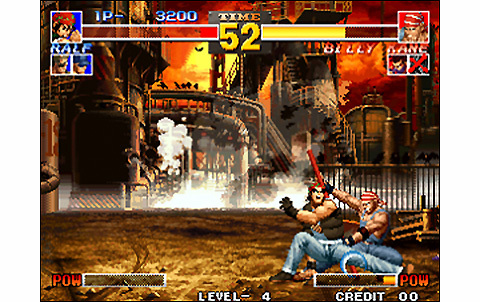 After a dynamic and captivating introduction setting up the scenario around Rugal and the tournament scene, it comes to the facts. And then, a surprise awaits the player: Team Edit makes its appearance! 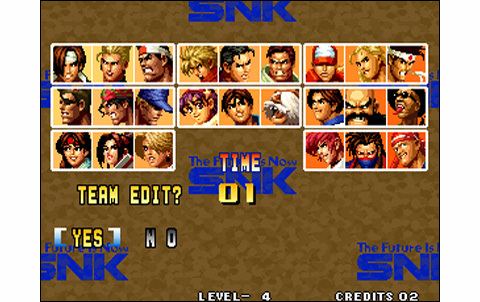 Unlike in The King of Fighters 94, you can now edit your own team of three fighters, by choosing among all the panel of characters, while still retaining the option to select the standard teams. 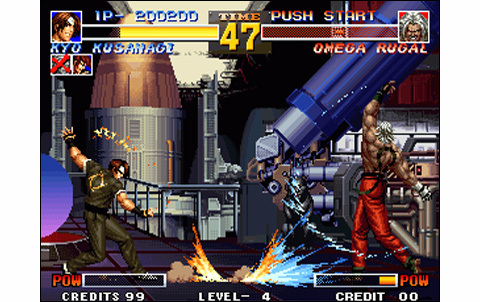 Incidentally, to view the 'real' endings, players have to use one of these basic teams. 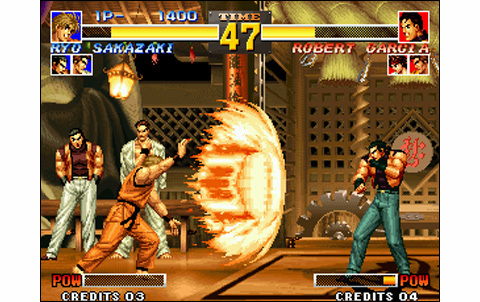 The possibilities are increased tenfold with this new opportunity, and we now have the pleasure to combine our favorite fighters together, by creating for example a crew including Ryo, Terry and Kyo! 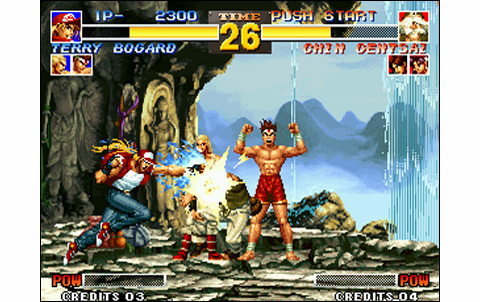 This option should delight many players, who can finally, for the first time in the series, realize their dream of making their team packing both heroes of Fatal Fury and Art of Fighting. Meanwhile, the single game is still available, plus a true comprehensive versus mode: what more could we ask? The characters have been slightly re-worked and they look thinner, and also move in a much more natural and smoother way. 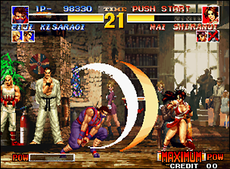 New melodies made their appearance, sound effects have been enhanced to be more impactful and vocal digits are slightly more numerous than before. 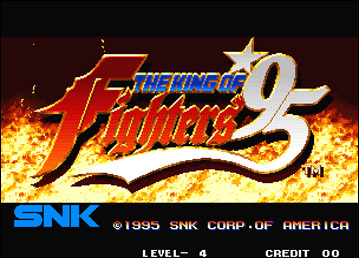 So technically, SNK managed to provide a slightly higher episode than the 94', but hey, we expected that a little! 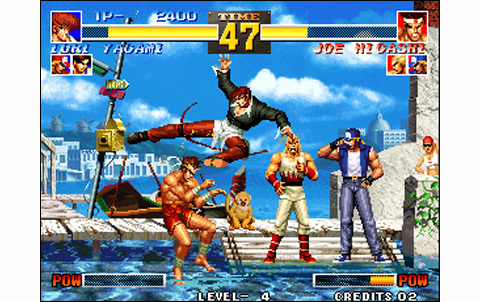 The most important point is probably the gameplay, which gains depth: counters during dodge, jumps on two levels, game speed increased, plus a plethora of new combos and furies. A few hours in practice will not be too much! 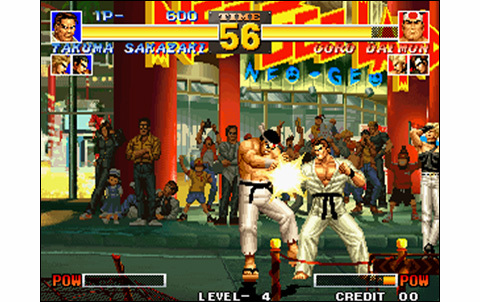 Beautiful graphics, animation improved, cool soundtrack and percussive sounds, rich gameplay close to perfection, versus mode, roster of twenty-six characters (two Bosses to unlock with a code)... All these facts are impressive, and the competition is totally dominated at the time. 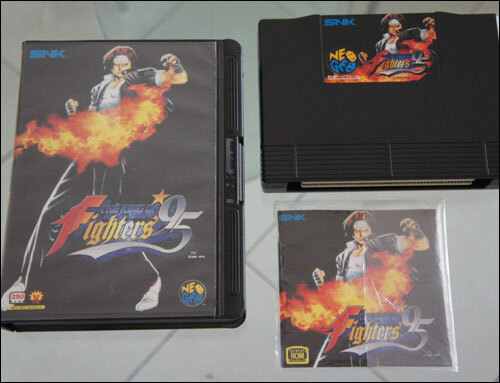 Oh yes for sure, the more recent Kof are doing better, certainly. 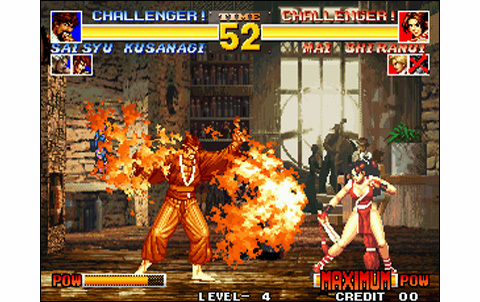 But back in 1995, The King of Fighters 95 is the major versus fighting reference , purely and simply! 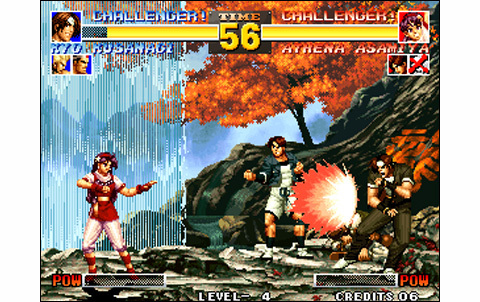 New backgrounds are sublime and the whole is pretty varied, while new fighters have been greatly drawn and the ancient ones are improved. 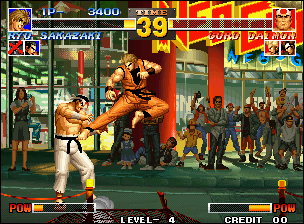 Animation is a lot smoother than in Kof 94. Some characters are still a little bit stiff, but overall it's much better. 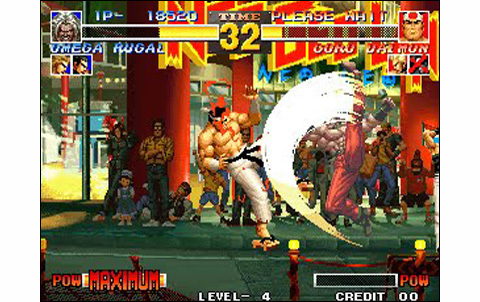 The extra megs shows, with more digits, new themes, more crushing impact noises. 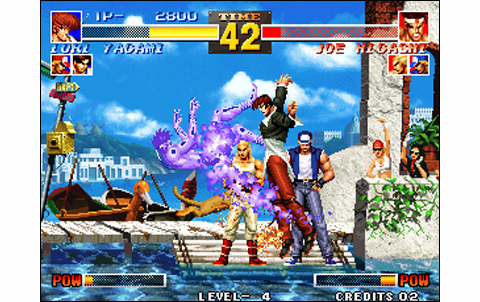 Game still features twenty-four characters (+two hidden), some news moves and combos, and in particular the Team Edit that offers brand new possibilities. 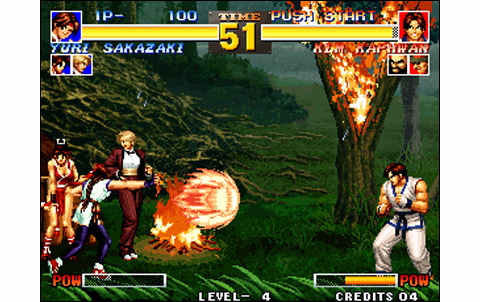 Some news (big jump & small jump, combos, more speed, counter attack during escape) makes better again what was already very good in Kof 94. 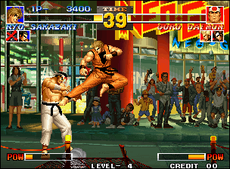 Improved realization, many new moves and combos for the characters, the Team Edit: those are great improvements making this episode one of the best ever in the series. About 50 euros for a japanese version, it would be a shame not to give it a shot! For such an awesome game, this amount of money is more than honest. Be aware that the game price is raising by now, so if I were you, I wouldn't wait too much for adding it to my collection.